A flock of birds took flight at the cacophonous roar echoing off the hillsides of Maseru. 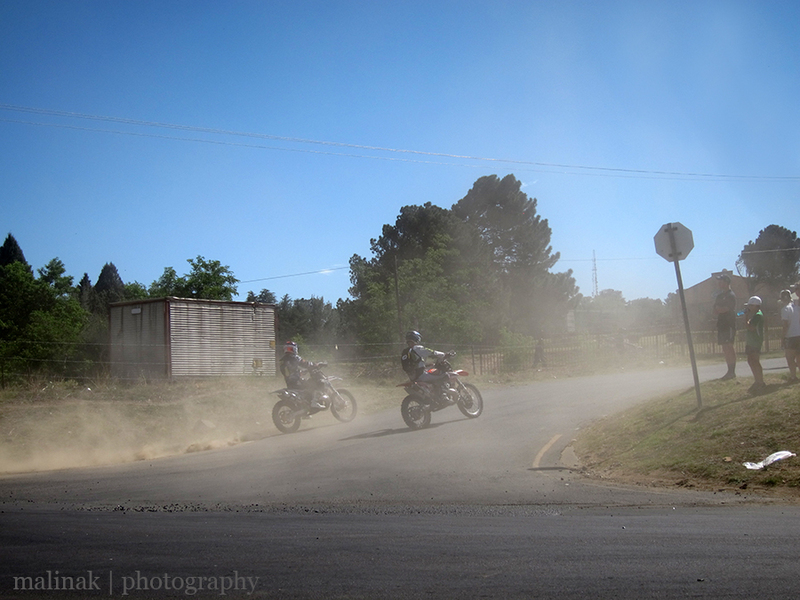 The noise shattered the calm morning peace and signaled the start of the annual Roof of Africa motorcycle endurance race. The three day event sees close to 400 riders, predominantly from South Africa, tackle some of the unforgiving terrain of Lesotho. 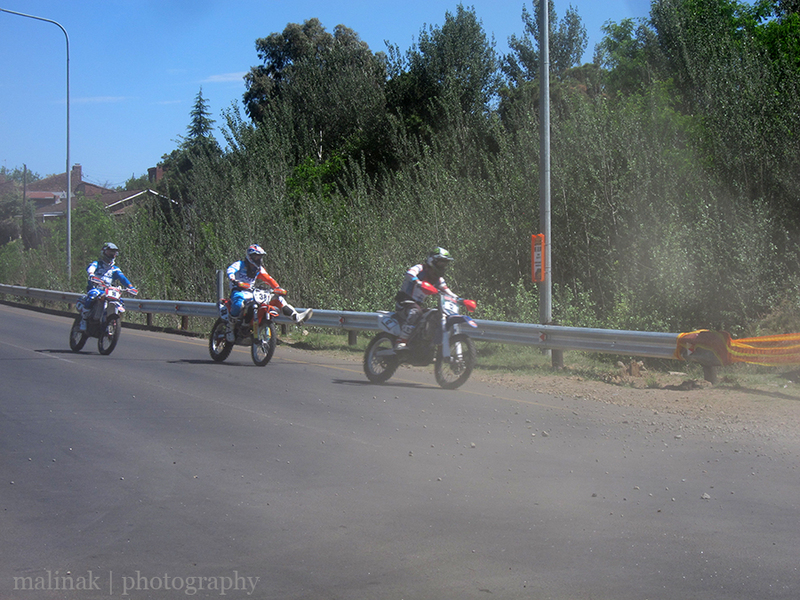 It is generally considered to be one of the toughest endurance motorbike races in Africa, if not the world. Before they get to the really tough bits, it starts with ’round the houses’, which sees heats of 75 or so riders charging around the streets of Maseru. Since the course went right in front of the US Embassy, I had the morning off as we couldn’t get to work. The second stroke of luck sees the course go right by the end of our street, which meant we could walk down and watch the riders come shooting down the road and then take a left turn up the hill. This turn caused a few near misses, but generally it was just a lot of guys, they are almost all men, on motorbikes shooting by us. Mosa was fairly unimpressed and slept for a while under my legs, though we were glad that she wasn’t too bothered by the noise. After the tame start, the riders head into the foothills of the Maluti Mountains for the next two days. We had no real plans to go and watch, especially with heavy rain forecast, but our friends Ian and Ruth convinced us to go on Saturday so off we went with their baby and three dogs in tow. We are really glad to have gone as it gave us the chance to see the racing as well as more gorgeous scenery and a truly unique event for Lesotho. The first place we watched had very little activity with just a few riders coming past and so we drove to the finish at the top of Bushman’s Pass, nearly 2,300 meters up. Here the riders come up what can accurately be described as a goat track, complete with bushes, rocks and drunk spectators for obstacles. Add in the driving rain and being on the bike for six to seven hours before they even get to that point, we don’t know how any of them make it up! Whilst we don’t intend to get involved in this sport, it was impressive to watch people fight through the boundaries of endurance, and succeed in doing so. 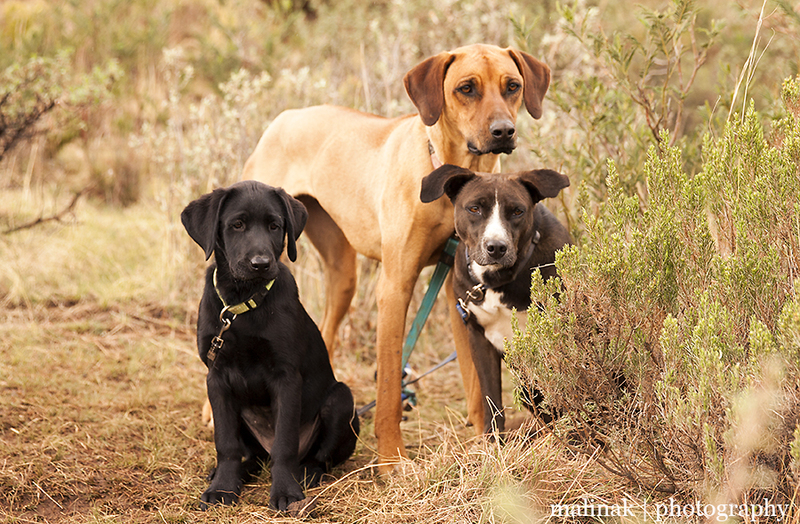 At the very least the dogs had a great time… what a gorgeous trio! Thanks again Ian and Ruth for a wonderful day out!